Having trouble seeing the readout on your stereo? 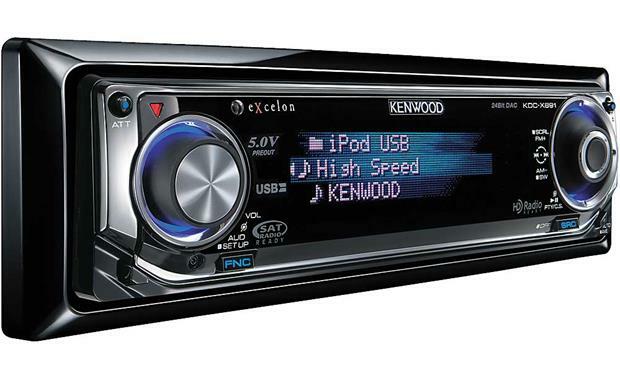 The Kenwood Excelon KDC-X891 CD receiver offers a motorized faceplate with several tilt-position settings to give you the best viewing angle  even if your stereo's low in the dash. The 3-line display highlights your song text info, and it's loaded with animations and wallpapers that you can customize with your own images. The sleek faceplate features an attractive, uncluttered look that'll complement any interior. Use the USB input to control your thumb drive or USB-capable portable. For iPod®, add the optional connecting cable. Use Kenwood's "Supreme" sound feature to add some sparkle and body back to those compressed music files. The potent power section and premium digital-to-analog converter deliver music that's robust and full of detail. You can shape the sound with the 3-band parametric equalizer, which lets you adjust the centerpoints for your treble, midrange, and bass controls. You'll appreciate the three sets of 5-volt preamp outputs if you're adding external amplifiers to your stereo system. And the receiver's high- and low-pass filters let you tune the sound to suit your speakers, whether you use the preamp or speaker outputs. The Graphic Motion Analyzer feature calculates G-forces during acceleration, braking, and cornering, and includes a stopwatch. 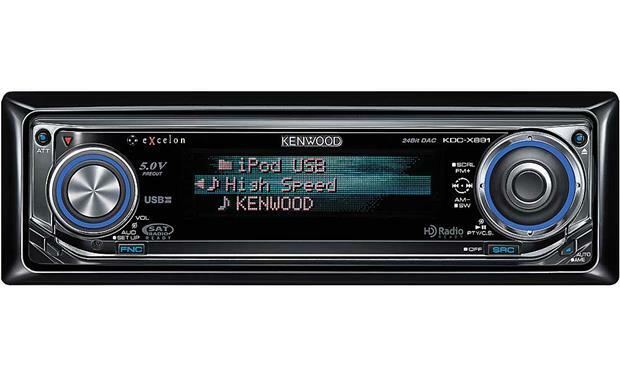 Overview: The Kenwood KDC-X891 AM/FM CD receiver features a motorized-slide-down-detachable face, rear auxiliary input, 3 sets of 5-volt preamp outputs, CD changer and Satellite radio controls, Bluetooth and iPod ready functions, as well as a rear panel USB connector, plus AAC/MP3/WMA/WAV playback. The CD player comes with a soft face case and an IR wireless remote control. The unit's Mos-Fet amplifier is rated at 22 watts x 4 channel RMS and 50 watts x 4 channel peak. Adjustable Motorized Slide-Down Face: The unit features a motorized-slide-down face that detaches from the chassis to deter theft. The face panel electronically slides down to insert or eject your disc. The electronic face panel has four adjustment angles (0-3) to choose from to help with visibility in your vehicle. There is a red indicator light that will flash on the unit after the face has been removed to warn potential thieves. You can turn this flashing LED on or off. The CD player comes supplied with a soft black fabric, draw string face case to protect the detachable face when you have it off the chassis. 64-Color FL Display With Graphics: The unit utilizes a large 64-Color Fluorescent display that features still and motion graphics. You can choose from six display layouts as well as between two motion clips, six wallpaper images and a wallpaper scan mode. Through the unit's USB port you can also download your own movie clip, a custom wallpaper image or a different G-Graphic. By downloading a custom image from your PC onto a USB thumb-drive via Picture Engine you can then connect your USB thumb-drive to the USB port on the KDC-X891 and use the custom image for the unit's display screen. Picture Engine is an application software distributed from Kenwood's official website. Utilizing this software, you can create an original still or motion image file to display. 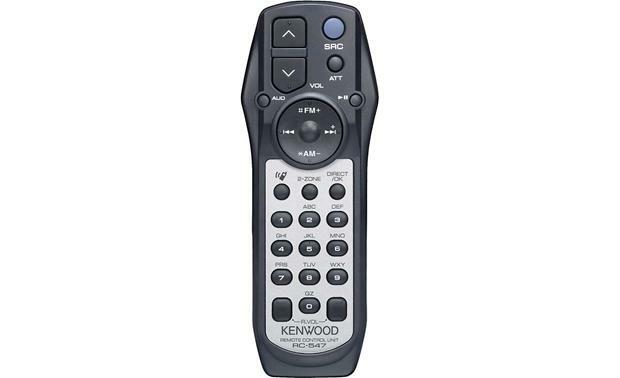 Go to http://www.kenwood.net-disp.com/ to access the application software. Note: There is no way to delete the downloaded pictures. When you download a new movie or wallpaper it overrides the currently downloaded movie or wallpaper. Graphic Motion Analyzer: This unit is equipped with a sensor that measures the forces of gravity on the vehicle. This sensor enables the receiver to calculate G-forces during acceleration, braking, and cornering. The G-Analyzer also has a stop watch that can be automatically started when forward or reverse G-forces are detected. Setup and calibration for acceleration and braking must be performed before using the G-Analyzer. The Graphic Motion Analyzer offers you 5 graphic displays to choose from: G-Graphic, G-Meter, G-Counter and Stop Watch, along with a HorsePower function that measures and records the max horse-power of your car. You can specify what type of vehicle you are driving to calibrate the G-Analyzer by selecting from the following choices - Mid Size, Full Size, SUV, Van, Pickup Truck, Sporty or Compact. The GMA's information can be viewed as numerical data or enhanced graphics on the head unit's display. Note: The HP or G value measured by this unit may not be completely accurate due to its simplified method of measurement. The G-Analyzer is only for reference and should not be used to confirm the horsepower specifications of your vehicle. AAC/MP3/WMA/WAV Playback: The KDC-X891 can play MP3, WMA, WAV and AAC files with ID3 tag information recorded on CD-ROM, CD-R, and CD-RW discs in ISO9660 Level 1/Level 2, Joliet, Romeo and Long file name formats. 24 Bit D/A Converter: The Kenwood KDC-X891 utilizes a 24-bit digital to analog converter for superior CD sound quality. Supreme Setting: When MP3 or WMA files encoded at a low bit rate (less than 96 kbps, 44.1k, 48kHz) are played, the Supreme Setting function restores their high frequencies so the sound quality is closer to files encoded at a high bit rate. The processing is optimized for the compression format and the bit rate used. When the Supreme Setting is Off, the unit plays the original sound stored in the audio file. AUX Input: The KDC-X891 is equipped with a rear panel 3.5mm minijack auxiliary input for connecting external portable audio devices such as an MP3 player or Tape walkman. The receiver allows you to turn the Auxiliary input On our Off so you don't have to scroll through that source if you are not using it. Auxiliary Display: The KDC-X891 allows you to select the source type displayed when using the auxiliary input. You can choose from AUX, DVD, Portable, Game, Video or TV. Dual Zone: The Dual Zone mode allows you to output the Main source and the Auxiliary input separately for the front and rear channels. You can select whether the auxiliary input will play in the front or the rear. 3-Sets of 5V Preamp Outputs: The KDC-X891 features front, rear and subwoofer 5V preamp outputs. The Subwoofer preamp output can be turned On or Off and adjusted independently. The front and rear speaker preamp outputs are balance and fade adjustable. The subwoofer preamp output is non-fading. All the preamp outputs are attached to the chassis by a 7.5" pigtail. Built-In Amp Setting: If you are using external amplifiers to power all of your vehicle's speakers you can turn the unit's built-in amplifier off to enhance the player's preamp output quality. Front and Rear High-Pass Filter: The KDC-X891 features an independent High-Pass Crossover for the front and rear channels. You can adjust the high-pass crossover from through, 40, 60, 80, 100, 120, 150, or 180, 220Hz. The "Through" selection is a full-range setting. This feature is very helpful when you have smaller-type speakers in the front and larger-type speakers installed in the rear of the vehicle. Low-Pass Filter: The receiver features a built-in Low Pass Filter control for the preamp-output when the Subwoofer Output is "on". You can select from 50, 60, 80, 100,120Hz or Through. The "Through" setting allows your external amplifier's crossover network to do all the filtering for your subwoofer. Subwoofer Level: Once you have switched the Subwoofer Output to "on" you can independently control the subwoofer preamp output level from the CD receiver. You select levels between -15 to +15. Speaker Settings: The Speaker Setting function tailors the System Q Sound Control settings according to the type of speakers in your vehicle. You may select a Speaker Setting of "SP Off" (flat), "SP OEM" (for OEM factory speaker systems), "SP 6x9/6" (for systems with 6" and 6"x9" speakers), or "SP 5/4" (for systems with 4" and 5" speakers). Note: The Speaker Setting affects the bass, midrange, and treble values of the System Q presets. The speaker setting should be selected first. Note: The above values reflect the System Q settings when the Speaker Setting function is turned off. When the Speaker Settings are selected, the System Q level settings are different. Bass/Treble/Mid Control: The KDC-X891 features independent Bass, Treble and Midrange control. You can adjust each one from -8 to +8db. Detail Audio Control: The Detail Audio Control allows you to adjust the following settings for the Bass, Treble and Mid levels. Bass Management System (B.M.S. ): This unit is equipped with an interface (pink/black wire in the wiring harness) which controls certain special features of B.M.S.-equipped Kenwood eXcelon amplifiers. This unit, when properly connected, can remotely activate and adjust the amount of bass boost in the amplifier. You can choose between +6dB, +12dB, or +18dB bass boost, or flat (no boost). In addition, you can lower the bass boost center frequency by 20%, switching between "Normal" and "Low". Loudness: The Loudness feature compensates for low and high tones during low volume. You can turn this feature either on or off. Only the low tone is compensated for when the tuner is selected as a source. Volume Offset: The level of each source may be independently adjusted to prevent radical leaps in output volume when switching from one source to another. The available settings range from -8 to 0. Rotary Volume Control: The CD receiver uses a rotary volume control that increases and decreases the volume of the stereo from 0 to 35. The rotary knob also controls other audio settings such as Bass, Treble and preset EQ settings. Multi-Control Wheel: The Kenwood receiver also features a Multi-Control Wheel, that when used with an iPod, lets you control all operations via a single control knob just as smoothly as the iPod's scroll wheel. Attenuator: The CD receiver features an Attenuator button that turns the volume down very quickly with one touch of one button. Source Tone Memory: This feature allows you to store System Q bass, middle and treble tone settings for each source (CD, FM, AM and Aux). Station/Disc Naming: The unit allows you to attach an 8-character title to a radio station or a CD. The unit can memorize up to 30 FM/AM station names and 10 CD names. Text/Title Scroll: The KDC-X891 will display CD text, Audio file text and Satellite and HD radio text. You can turn the scrolling feature "on" to scroll longer titles across the screen. Last Position Memory: If the unit is shut off or switched to the tuner mode while a CD is playing, the next time CD is selected as the source, playback will resume from the point where it left off. CD Force: When there is a problem with playing a CD with a special format, this setting plays the CD by force. Some CDs still may not play in the CD Force mode. CR-2 Advanced Tuner: This unit uses Kenwood's CR-2 Advanced tuner for clear radio reception. You can choose one of three tuning modes: Auto 1 (seek tuning), Auto 2 (cycles through and tunes the selected band's preset stations only with each button press), or Manual. Clean Reception System Circuit (CRSC): This circuit controls multi-path distortion by reducing stereo separation. As stereo separation is reduced, multi-path has less effect on the radio signal, improving reception in areas with tall buildings and mountains. The CRSC circuit can be turned on or off. Radio Data System (RDS): The unit's tuner features RDS (Radio Data System). RDS is a service used by some radio stations to transmit data outside of normal radio broadcast signals. When an RDS station is received, you can immediately find out what kind of data is being transmitted by looking at the program service name. RDS features an emergency transmission function that interrupts regular programming to broadcast an emergency announcement (such as a tornado or severe storm). There is also a switchable Traffic Information function, which will automatically tune a traffic bulletin when it is broadcast, even when you're not listening to the radio. Auto Memory Tuning: Not only does the CD receiver's tuner allow you manually enter your desired presets you can choose to have the unit automatically put stations with good reception in the memory banks automatically; this is a handy feature when traveling. The tuner features 3 FM banks (1, 2, 3) and 1 AM bank. You can store 6 presets for each AM/FM bank giving you a total of 18 FM presets and 6 AM presets. Tel Mute: The KDC-X891 features a cell-phone mute wire (brown) in its harness that when hooked up to your car's phone system mute wire will automatically mute the receiver's audio signal when a call comes in. Beep Tone: The CD player features a touch sensor tone that beeps when you have selected a function of the unit. You can turn the beep tone ON or Off. Security Code: You can enter a 4-digit security code which must be used when the unit is removed from the vehicle, or the constant power source is disconnected from the unit. When constant power is restored to the unit, the security code must be entered before the unit becomes operational. Date Adjustment: You can enter the current date into the head unit's memory to help you keep up with what day it is while you are on the road. Display Illumination Control: This function turns off the display when have not performed an operation for 5 seconds. This is effective for when you are driving at night. Dimmer: The dimmer function will dim this unit's display automatically when the vehicle light switch is turned On when you connect orange/white Illumination wire of this player. Remote Control: The KDC-X891 comes with the RC-547 IR wireless remote control with a full numeric keypad. The remote will control Audio, CD, Tuner, Satellite, HD radio and Dual Zone functions. It is powered by 2 "AA" batteries (supplied). The dimensions of the remote are: L = 5.362", W = 1.962", D = 1.115". Steering Wheel Remote Compatibility: The KDC-X891 has a "steering remote control" lead on the back panel. When used with the optional SWI-JACK interface (item number 127SWIJACK), you can retain the use of your steering wheel and/or rear seat radio controls when replacing the factory head unit in select vehicles. The SWI-JACK is compatible with over 95% of the vehicles made from 1986 to the present. Compatible vehicles include many Acura, Audi, BMW, Buick, Cadillac, Chevrolet, Chrysler, Dodge, Ford, GMC, Honda, Hummer, Infiniti, Isuzu, Jaguar, Jeep, Kia, Land Rover, Lexus, Lincoln, Mazda, Mercury, Mini, Mitsubishi, Nissan, Oldsmobile, Plymouth, Pontiac, Saab, Saturn, Suzuki, Toyota, and Volkswagen vehicles and Harley Davidson motorcycles. Please consult "What Fits My Car" to see if your vehicle is compatible. XM Satellite Radio: To receive XM Satellite Radio, you can connect the optional CNP2000UC XM Mini Tuner and the CNP-KEN1 Kenwood adapter cable (package item number 700XMKEN1). SIRIUS: To receive SIRIUS Satellite Radio, you can connect the optional SC-C1 SiriusConnect vehicle tuner (item number 607SCC1) and the Kenwood/SIRIUS adapter (item number 113KCASR50). Dock: Select dock-and-play and portable SIRIUS radios can be controlled using the Kenwood/SIRIUS adapter (item number 113KCASR50) and the SC-VDOC1 dock (item number 607SCVDOC1). Auxiliary Input: A portable satellite radio receiver, such as the Delphi SkyFi3 or SIRIUS Sportster, can be connected to the head unit via the auxiliary input (adapter may be required). Bluetooth Ready: The unit is also Bluetooth compatible using the optional Kenwood KCA-BT100 Bluetooth adapter. Using this adapter you can make and answer phone calls from the Kenwood headunit. You can even download your Phonebook information from your compatible mobile phone into the headunit. You are able to register up to five compatible Bluetooth cell phones when using the KCA-BT100 adapter. USB Port: The Kenwood KDC-X891 features a rear panel 2.0 USB type-A port that is attached to the chassis with a 39" cord to allow for various placement options during installation. The USB port enables connection to portable USB mass-storage players, USB thumb drives and audio control of MP3 player. The USB port is compatible with all USB mass storage class devices that support the FAT16 or FAT32 file system. A single or multi-slot card reader can also be connected the USB port, allowing your music to be put neatly into different types of memory cards. iPod High-Speed Connection: The USB port and AUX input are also compatible with iPod devices when used with the optional KCA-iP200 adapter (part number 113IP200, sold separately). The USB Direct Connection enables high-speed iPod data communications of 12MB/bps via the optional KCA-iP200 (2-Wire) interface. One end of the cable plugs directly into your iPod's dock connector while the other end of the cable uses two connectors that plug into the back of the headunit. The USB type-A connector portion of the cable plugs into the receiver's USB port and handles the control and charging of your iPod, so you can navigate through your music files using the headunit's controls and view song info on it display. The 3.5mm miniplug connector portion of the cable plugs into the Auxiliary 3.5mm input on the receiver and transfers the music from your iPod to your Kenwood CD player. By using the Auxiliary input the music travels to the receiver as an analog signal, so you can even play the Digital-Rights-Protected files you've stored on your iPod. The controls of the KDC-X891 are seamless when used with the optional KCA-iP200 and include metadata browsing and playback of DRM contents, as well as the ability to choose any iPod playback mode to suit your listening application. Changer Controls: This unit is directly compatible with Kenwood changers manufactured in 1998 or later. If the changer has an O-N switch, the switch will need to be set to the "N" position. In addition to basic disc navigation features, this unit has the following changer controls: direct disc access (using the remote), direct track access (using the remote), track intro scan, track repeat, disc repeat, disc random, and magazine disc random. When connected to a CD Text capable CD changer or an MD changer, this unit can display disc and track titles for discs encoded with disc and track title information. The text information can be scrolled manually or automatically. Rear Auxiliary Input "Ready": The unit already features a rear panel auxiliary input, but if you need a second auxiliary input, another one can be added to the rear of the unit. When used with an optional adapter, this unit can accept a rear input from an auxiliary source. When the CA-C1AUX adapter (item 113CAC1AX) is used, you cannot connect a CD changer to the head unit because the adapter plugs into the DIN changer control connection on the head unit. When the KCA-S220A 2-changer switch (item 113KCAS220) is used, you can connect a CD changer and an auxiliary audio source at the same time. When an auxiliary audio source is connected, you can choose from one of six names for the source: Aux Ext, TV, DVD, Video, Game, orPortable. Supplied Software: The KDC-X891 comes supplied with the Kenwood Music Editor Version 1.0.0 CD-ROM. Kenwood Music Editor is a desktop software that helps organize, manage and transfer music files to your USB devices from your PC. Automatic Playlist Generation is another function of this software which analyzes each song based on the tempo/spectrum distribution and categorizes them into familiar genres such as POP, Rock, Ballad, etc.